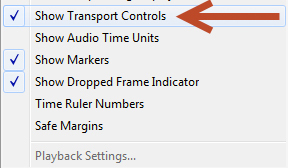 Follow this tip to customize the buttons and playback (transport) controls that appear in your Premiere Pro monitors. 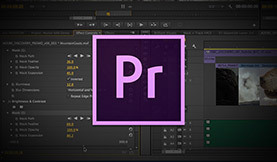 If you’re not yet implementing shortcuts in your video editing, you’re likely reliant on the playback buttons that appear below the source and program monitors in the Premiere Pro editing interface. In this post, you’ll learn how to customize these buttons, adding some features that aren’t in the default view or making the buttons disappear altogether. Choose which buttons you’d like to include in the visible playback controls. If you’re not sure what each one does you can hover over any button in the Button Editor window and get a tool tip telling you what the button is and its corresponding keyboard shortcut. At the bottom of the subsequent dropdown menu deselect “Show Transport Controls” and the buttons will disappear. Are there any buttons you rely on that aren’t in the default view?